Each of our prosthesis is entirely submitted to strict control along production process. We set up home a dental prosthesis professional training for updating techniques knowledge and prosthesis practices. The technical management and controls are insured by experienced dental prosthesist. We grant three years of warranty on the most of our products. For this, we are committing on repairing and remaking partially or totally, three times maximum, the prosthesis according to customer request and our technicians cause analysis of the return. If our product quality wouldn’t meet your requirements or expectances, we should find out the possibility to reimburse you, the customer. 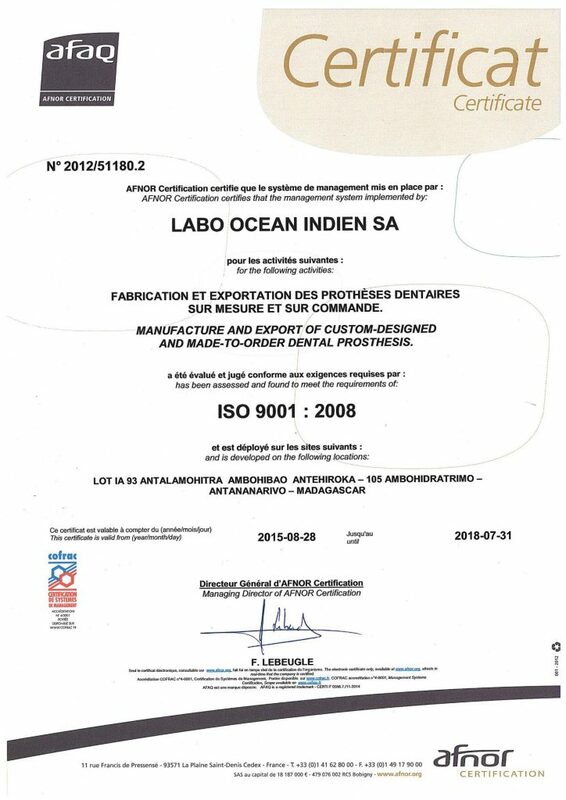 This year, LABOOI is certified ISO 9001 ver.2015. It demonstrates our commitment to enhance our willing to satisfy more our client needs and requirements in terms of quality and service. It also performs that our lab production process complies with international standard, legal rules and requirements, and legal regulation suitable for dental prosthesis confection.